MESH: We Are Training Again! 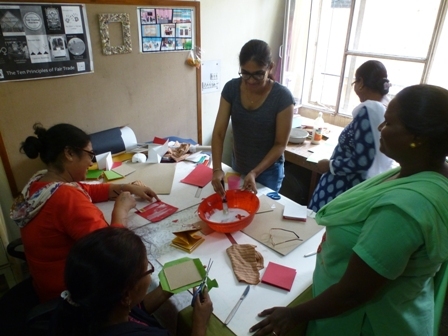 Today four women from Anand Crafts have started their book-binding training in MESH Design Studio. 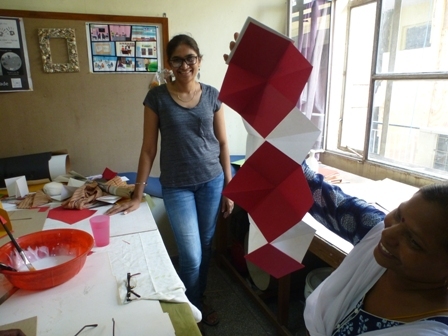 Anand Crafts is the production unit of Anand Mahila Mandal, a women's society in a leprosy community here in Delhi. They are experts in a lovely lace craft called tatting. In the last few years MESH has found it difficult to secure enough orders for their tatted products to keep them busy so we are offering this training as a way of product diversification in the hope that they will be able to expand their markets and have more regular work. They will learn some traditional ways of book binding with paper as well as cloth and also some very pretty Japanese book binding techniques where the sewing, binding the papers together, is made an artistic feature. We hope that they will finally produce note books using some of the textiles, printed, dyed and woven made in other groups supplying MESH. How about an apron, oven mitt and note book for recipes, in matching designs? Watch this space! The moment when you reveal your first new product is always so exciting!